Jungfrau means 'maiden' or 'virgin' in German. Jungfrau is one of the highest peaks in Switzerland; you need to take the specifically designed cable car cog railway for this high altitude journey. This is one of the special inventions of the Swiss to scale peaks like Jungfrau. Crisp white snow could simple stun the adventure traveler at a 360 degree view. 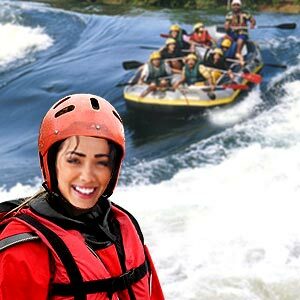 And if privileged with the right weather, you could end up using the highest ATM, sipping the highest coffee and even try the highest husky dog ride in all of Europe. The Jungfrau Railway runs through the heart of the mountains and up the highest train station in Europe, nearly 3454 meters above sea level. The mountain views are grandiose; giant Jungfrau along with Eiger and Monch are the longest rivers of ice in the Alps. The unique round-trip takes you from Interlaken to the highest railway station in Europe, at a height of 11,782 ft., Jungfraujoch, also popularly called, the top of Europe. The terminus known as Top of Europe is indeed an underground station with tunnels leading out onto the glacier surface of the Jungfraujoch. The Jungfrau railway leads from Kleine Scheidegg up to Jungfraujoch. Nearly 1400 meters in height, it covers a distance of more than seven kilometers in tunnels along the nine kilometer long stretch. The first section of the route from Interlaken heads to Lauterbraunnen - by cog wheel to Grindelwald from where it ascends via the meadows of Alpiglen beneath the North Wall of the Eiger to the busy station of Kleine Scheidegg. From Lauterbraunnen, the train reaches Kleine Scheidegg via Wengen to the steep forested slopes above Lauterbraunnen. The top of Kleine Scheidegg is an engineering marvel. A tunnel runs through the solid rock of the Eiger. A peek through the window from an altitude of 2865 meters is a scene of permanent ice and snow. Europe's highest train station rests in the peak called 'Sphinx'. A lift, in the interior of the summit takes visitors to the peak and the famous observatory platform which offers magnificent views of the mountain and the Aletsch Glacier. Little wonder that the Jungfrau-Aletsch region is declared as the first UNESCO World Heritage Site in the entire Alpine region with its unique plant and animal life. Jungfrau is in fact one of the most picturesque places in Europe and the beautiful Swiss village of Lauterbraunnen surrounded by the amazing Alps and stunning waterfalls can leave the visitor speechless. Bright blue skies, bouncing on the snow-capped mountains and you feel like being on top of the world. The Jungfrau railway is famous for its prices as it is for its spectacular views. There are some excellent train ticket offers to Jungfraujoch - a round trip, top of Europe from Interlaken Ost, with a stopover in Grindelwald or Wengen in the same trip date, and special fares for Swiss Pass, Swiss Card, and Eurail. The glistening Ice Palace, a walk on the eternal snows of the Jungfrau plateau, the Sphinx observation hall and terrace - you can go snow disking, or enjoy dog rides, or ski in the Snow Board Park, or even check out the eternal snows, walking on top of one of the world's most beautiful places. A Plateau with hikes in the eternal snow, a Glacier restaurant, and the High alpine research exhibition are the other attractions on the Jungfraujoch. With amazing attractions all year round, Jungfraujoch can be visited at any time of the year. Experience the high Alpine winter world at close quarters, in all four season whatever be the weather from the secure Ice Gateway which links the Ice Palace with the glacier plateau. Summer adventure attractions include snow disk, Tyrolienne and the high Alpine research exhibition. 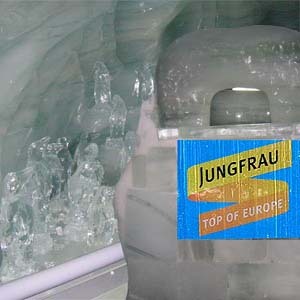 The Jungfraujoch Ice Palace stands tall in this peak and offers the most spectacular sights in Europe. The story goes that in 1934 two local guides started to carve the glacier with their chisels and saws. They slowly carved the innards of the glacier, working tirelessly in the freezing temperature. They made halls of 1000 sq m and then went on to shape the beautiful sculptures out of sheer ice. The expanding chambers with the sculptures remain as global attractions. The ice masses glacier moves northwards and melts into the North Sea. It is to stop the ice palace from flowing down that it continuously needs to be sculpted and re carved. The Ice palace can melt in the heat emanating from the body of the visitors on the intricate figures. Cooling systems have been installed to allow the temperature not to rise above -2 to -3 degree C.
The Ice palace is carved out of glacier and one has to walk through a long tunnel, cut of ice and thoroughly slippery to get out there. A world of shimmering blue ice can engulf the traveler in the glacier. The tunnel leads to a hall, with couple of chambers and connecting passages. Ice roof, flooring and walls and arches of ice can be found everywhere. The carving technique, though difficult, draws the spectators to life-like appealing ice figurines. It is the lighting in the Ice palace that goes to enhance the brilliance of the place. The lighting of the arches, the chambers and the statuettes accentuates their splendor and fine detailing. The lights reflecting off the arches and bows and throwing a dazzling glow all around the sculptures lend a warm feel to the curious visitor. Unbelievably, apart from the birds and animals, penguins and people, ice sculptures of automobiles and furniture are wonderful to see. Situated in the impressive trough valleys in the Alps, Lauterbraunnen is sandwiched between gigantic rock facing mountain peaks. With 72 thundering waterfalls, and secluded valleys, colorful alpine meadows and lonely mountain inns, Lauterbraunnen valley is one of the biggest nature conservation areas in Switzerland. The name Lauterbrunnen, means 'many mountains' and suggests a magnificent landscape. Inspired by the roaring waterfalls, the well known poet Johann Wolfgang Von Goethe wrote the poem, 'Spirit song over the waters' in 1779. The Lauterbraunnen valley is 'U' shaped with a number of other valleys and waterfalls joining it at the top of the vertical valley walls. The area provides stunning results of the action of water on ice over time. The first villages to be established in this region were Murren, Gimmelwald, Trachsellauenen and Sichellauenen. The bell from the original church build in Lauterbraunnen in 1487 still stands in front of the new church to this day. It was in the year 1811 that Jungfrau Mountain was first climbed and mountaineering came into this area. 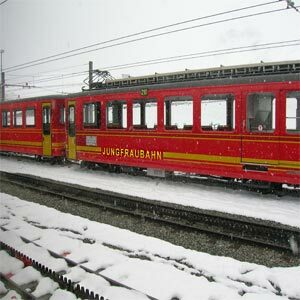 In 1892, the first railway came from Lauterbraunnen through Wengen and thereafter projects extended the system up to Jungfraujoch. Although there is no skiing at Lauterbraunnen, this town is a good hub, with access to Wengen and Murren in about 30 minutes. This town is the most central access to the whole area and even transit to Kleine Scheidegg area takes only about 45 minutes. Accommodation is cheaper in Lauterbraunnen and there is potential to ski back from Murren - Schilthorn area down to Lauterbraunnen. In Lauterbraunnen skiing happens during the months of January and February. It is then that skiers can make one of the world's biggest vertical descents down the route of the Inferno race, spread over 2200 meters from Schilthorn. Skiing is mainly split into three - Kleine Scheidegg - Mannlichen and Murren-Schilthorn. 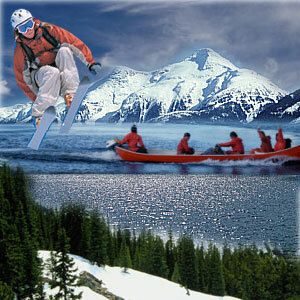 The Inferno ski race was conceived in the year 1928 and it happens to be the oldest ski race in the world. Created by the English skier Sir Arnold Lunn, the course starts just below the Schilthorn peak and ends in Lauterbraunnen. Every aspect of skiing is employed at various stages. With nearly 1800 people taking part in the race, it is considered one of the best challenges for overall skiing ability and stamina. There are two half pipes and jumpers corner in Wengen. A fair number of open runs make it easy for carving. The area is laced with toboggan runs, and it is not uncommon for the skiers, snow boarders on sledges to cross path at some point. Even in August, a visitor can play in the snow and enjoy the wonderful view of the mountains, valley and the blue skies. 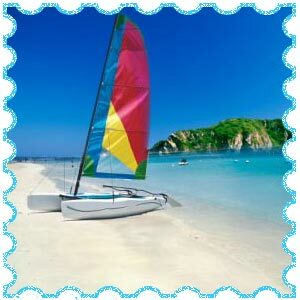 With the weather generally cold in this snow capped region, it is usually best to visit between February and April. Snow covered valleys, pristine ice glaciers, glistening and astonishing ice palace carvings, the unforgettable rail ride in Switzerland's Alps, a 'top of the world' experience. First Published Date: 21 Jun 2011 Last modified Date: April 18 2019 This page may have been updated recently as new information is available or the content may have been edited for better readability.